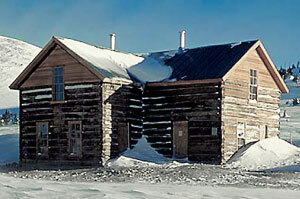 Boreas Pass Section House is an historic landmark. The Boreas Pass Section House was built in 1882 to house the railroad men and their families who took care of a section of the Denver South Park & Pacific narrow gauge railway that ran from Denver to Leadville over Boreas Pass. Next to the Section House sits Ken's Cabin (see huts menu above), also known as the historic Wagon Cabin, built in the 1860's when Boreas Pass Road was a mere wagon trail over the Continental Divide. These historic buildings, listed with the National Register of Historic Places, were carefully restored from 1992-97 with funding and assistance provided by the U.S. Forest Service, Park County, Texas A&M University, Colorado Department of Transportation, and Harris Construction. Summit Huts Association completed the upgrades to the Section House and Ken's Cabin and has a special use permit to operate the buildings as winter ski huts. Layout and capacity: Downstairs: 2 sets of single bunks Upstairs: 1 bedroom with 1 double bed and 3 single beds, 1 bedroom with 1 double bed and 1 single bed. Capacity 12. During the winter most hut users access the Section House from the Boreas Pass trailhead north of the hut. This is a gradual, straightforward ski/snowshoe up an old railroad grade and is one of the few routes that experienced skiers could use true cross-country gear on because of its low grade. There are access routes from the south that begin outside Como but they aren't used as often so some trailbreaking may be required. Please see the info sheet above for more details. 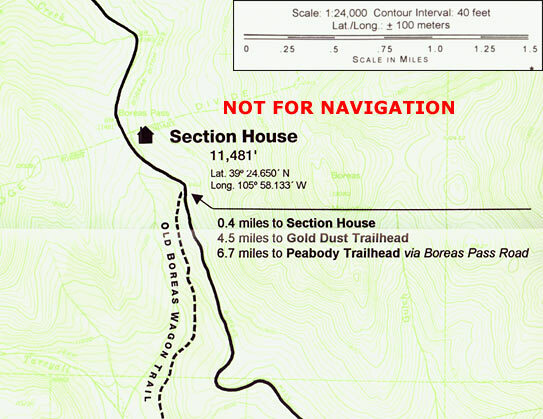 Please note there is no motorized access to Ken's Cabin and the Section House via Boreas Pass road. That road is closed to motorized use in the winter.